There are 6 obstacles in the game that hinder creatures on the main board, either by restricting their movement, causing wounds, limiting their ability to engage in combat (CBT), or blocking their line of sight (LOS) for channeling witcheries. The specific effects on movement are described in the context of the two obstacles that affect movement. All obstacles are classified by +/- depending on whether they allow (+) or prohibit (-) physical combat (CBT) and line of sight (LOS) for witchery channeling. All obstacles except the blood mist have an A side and a B side. The obstacle has the same effect regardless of the side facing up. The A and B sides are used as timers to track how long an obstacle has been in play. The King's Obstacles and conjured obstacles begin play with their A side facing up. When an obstacle's decay is triggered -- when the King dies for the King's Obstacles and the first refresh after they are conjured for for Conjured Obstacles -- turn the token over so that it’s B side is facing up. During the next refresh, remove the obstacle token from the board. There is 1 permanent obstacle: the blood mist. The blood mist cannot be affected by scrolls or player actions. The blood mist covers the center tile of the main board, which is the center of the King's sanctum. The King draws blood mojo from the blood mist and uses it to cast his devastating rituals. The blood mist in the center of the King’s sanctum is a living acid cloud from which the Kings draws blood mojo to cast his rituals. Any creature that enters the blood mist tile suffers 1 wound. Any creature on the blood mist tile during the wrap-up phase suffers 1 wound. The blood thickets and blood vines are the King’s obstacles: they are created and maintained by the King’s mojo, and die off when he dies. While the King is alive, these obstacles remain in play with their A sides up. On the first refresh after the Kings dies, flip these obstacle tokens to their B side. On the next refresh, remove them from play. These obstacles do not stop dying or re-appear if a new King enters play. Blood thickets are completely impassible tangles of twisted, thorny vines that prohibit all movement. Creatures may not move into or out of a tile containing blood thickets. Blood vines are ravenous, flesh-eating plants. Creatures that enter a tile containing blood vines suffer 1d3 wounds. Any creature on a tile containing blood vines during the wrap up phase suffers 1d3 wounds. Conjured obstacles include Deadly Vines, Entangling Vines, and Patches o’ Darkness. These obstacles remain in play for at most two rounds. When a conjured obstacle comes into play, place the obstacle token on the main board with its A side facing up. Conjured obstacles begin to decay on the next game refresh. A creature that is caught in deadly vines as they appear or enters a tile covered in deadly vines suffers 1 wound. A creature on a tile covered in deadly vines during wrap-up suffers 1 wound. Deadly vines stacked atop deadly vines or blood vines add their wounds together and are a single source of wounds. A creature that is caught in entangling vines as they appear or enters a tile with entangling vines may not move out of the tile. 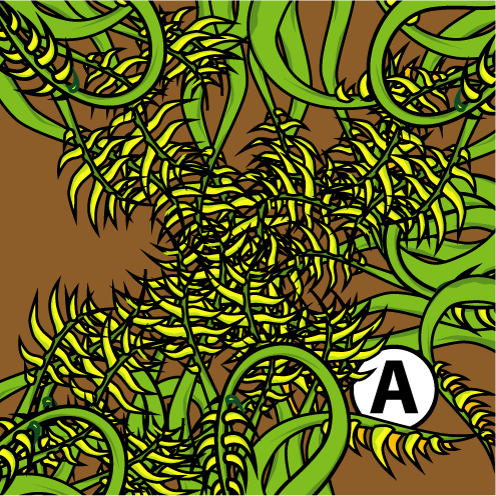 Creatures may fight in a tile covered with entangling vines but may not claim their foe’s tile as a consequence of an attack while they remain in the entangling vines. A creature that is caught in a patch o’ darkness as it appears or is occupying a tile covered by a patch o’ darkness is completely disoriented and may only randomly exit the tile. A creature exiting a tile covered by darkness must roll randomly to determine onto which adjacent tile it emerges (including the one by which it entered). If a creature attempts to enter or attack into an occupied darkened tile or a creature exits a darkened tile onto an occupied tile, the creature and the tile occupant swap tiles. Creatures are disoriented and lose all remaining movement when they initially exit a patch o’ darkness The creature’s controller may expend more mojo to move the creature after it has left the darkness. Items may be dropped but not picked up in darkened tiles. Example. A zimby in a non-darkened tile tries to attack a thug that is in a darkened tile. The zimby and thug switch tiles. Combat is not engaged.